Just the numbers associated with the two-wheeler industry in India are mind-boggling. It might not be too much of a surprise to know that the country is the largest two-wheeler market in the world, but what's astounding is the scale of the industry. Over 2.01 crore two-wheelers were sold in India in the last year. The largest two-wheeler maker in the country, Hero Motocorp sold an equally humongous figure of 73.84 lakh bikes in this period. The second largest player, Honda Motorcycle and Scooter India sold 57.75 lakh two-wheelers. Even Royal Enfield, a manufacturer which specialises in high-end motorcycles, sold close to 8 lakh bikes last year. The obvious question that pops up is, why do so many two-wheelers sell in our country? The answer is quite straightforward. The stark rise in the number of two-wheelers over the years can be attributed to the fact that they provide an inexpensive and effective solution to a problem that most Indians face on a daily basis; getting around quickly and efficiently. There is also some aspirational value attached to one's own set of wheels, making scooters and bikes even more attractive. This is especially true in Tier-II and Tier-III cities and will eventually be the case in rural areas too. Further, bikes work best in crowded Indian cities with grossly inadequate public transport systems. 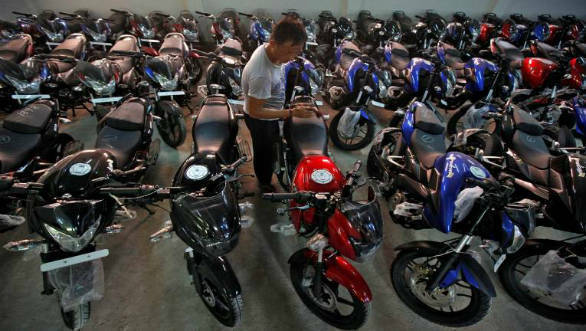 Motorcycles are high-involvement purchases for most buyers and a lot of thought and deliberation goes into the process. But as attractive as the prospect of owning a two-wheeler is, getting the vehicle insured or even renewing insurance for an older bike is not usually a pleasant affair. This holds true especially when you need to figure out an insurance plan that works best for you. There are innumerable insurance companies and online portals who will sell you one for your two-wheeler, but there isn't any guarantee of whether what you are getting would cover your needs entirely or if it is the most effective one. This entire exercise becomes even more stressful when you consider the numerous touts and middlemen that one must deal with at every stage. This is where COCORide, Comprehensive Two Wheeler insurance, launched by COCO by DHFL General Insurance comes into picture. COCO is a digital brand that allows buyers to choose insurance plans that can be customised to suit their unique needs. 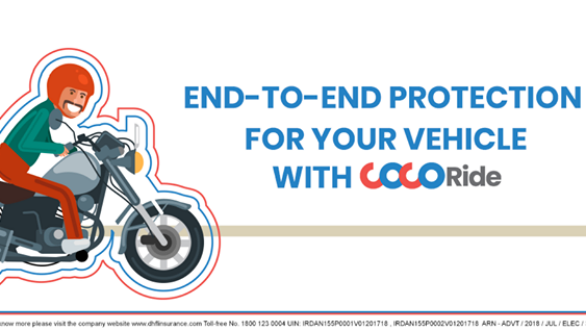 COCORide, the comprehensive Two Wheeler product, offers policyholders a whole lot of add-ons to choose from. The first advantage that COCORide brings to the table is the level of hyper-customisation it offers. A traditional insurance policy usually comes with a set of fixed add-on covers that might not really be useful to a buyer's specific needs. COCORide solves this by providing 12 selectable add-on covers which policyholders can choose based on where they live, whether their vehicle is on a loan, etc. A prime example of this would be the availability of choosing an EMI cover and Outstanding Loan Protector if they have a loan on the vehicle, or an Engine Protect add-on that is relevant for a person living in a flood-prone area. A big consideration factor in a price-sensitive market like India is the cost of buying insurance especially where spending on insurance coverages is not a standard practice in itself. COCO's web-based and direct-to-customer model helps customers get the most competitive rates. COCO's USP includes integration of underlying artificial intelligence and machine learning technologies that the service uses. As a prospective policy buyer interacts with the COCO website, by reading blogs, being exposed to infographics and videos, these new-age technologies work to understand the buyer's specific needs and utilise this information to suggest the best possible insurance cover for the buyer. The underlying technology is also geared to understand customer behaviour and create digital experiences customised for them. After studying each customer's profile, hyper-localised and unique user flows provide custom suggestions, and communication and plans are specifically directed towards them considering their needs. All of these features work together to provide an experience that is stress-free and make buying insurance, simpler than ever.